Liz Lothrop Update: Orange Out!!! Lunch time today at Sycamore high school! In support of Liz and the race to find a cure! Love the sea of orange! Orange is the color of the sun when it faithfully rises at dawn and sets each evening at dusk. "This is the day the Lord has made, we will rejoice and be glad in it!" He is faithful. 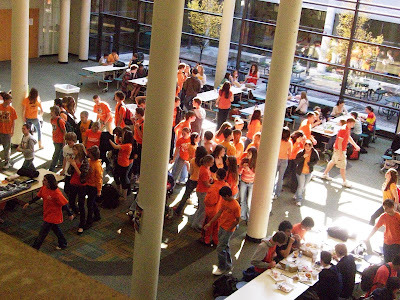 What a beautiful crisp fall day for wearing orange on Friday. Praying for you all!